I like making things and my mum taught me to sew when I was a little girl. The urge to make a patchwork quilt grew in me for a very long time and during the Easter holidays last year I gave myself up to it. The children’s school and mine had a holiday mis-match and I had four unasked-for days of me-time. Determined that I wouldn’t spend much money on it, I did my best to avoid buying anything new, but it did cost me about £25 in the end. I already had a sewing machine and lots of scraps of fabric and old clothes which I could use. I didn’t yet know that good quilting uses only pure medium-weight cotton, so this was a mix of whatever I could lay my hands on. The pale green chintz pictured belonged to my Grandmother and must be at least 40 or 50 years old. There are one or two other strips of fabric inherited from her in there too. The Very Hungry Caterpillar fabric was an impulse-buy in a local craft store, irresistible because the children and I love Eric Carle’s book so much. Most of my know-how came from the internet; a huge help at the early stages was Film in the Fridge, which taught me about strip quilting. I also used pieces from some unused bed linen and old cotton clothes, which I cut into suitable widths then joined with diagonal seams so they looked smart. I laid the strips out until I liked them, then joined them in pairs to avoid distortion. I added the pink and red side-strips (sheeting from Dunelm Mill) to make it wider, then made my quilt sandwich with a polyester batting and some backing cotton from Ikea. 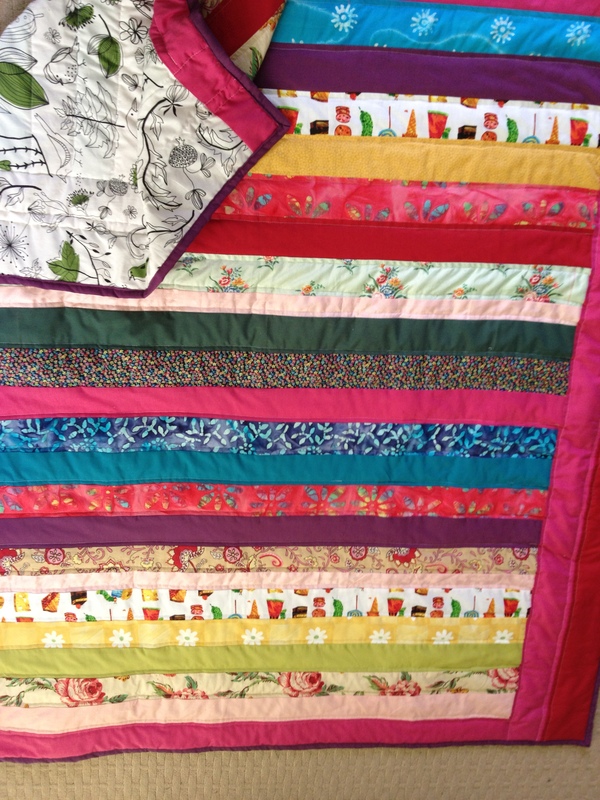 I quilted it very simply by stitching to one side of each seam. I couldn’t believe how long it took me and how much thread I used. To finish the whole thing off, I used this tutorial to add the purple borders. It was all done in two days and I absolutely loved doing it. Thus was my new hobby born. This is a beautiful blog, Fee! I might ask you to give mine a makeover!